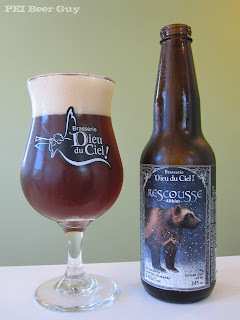 Rescousse, or "To the rescue" is a relatively uncommon style on store shelves - it's an "altbier". On the label, they advertise it as an "Ale rousse de tradition allemande", or a red ale of the German tradition. Altbiers should be more brown or copper, apparently, but that's just being nitpicky. The colour really is a rich, reddish-brown - like a deep copper when the light shines through it (think of a penny without its shine), and like a chocolate soda when it's not. The head is creamy and off-white, which leaves a solid curtain of lacing all the way down. The aroma is a rich, malty one, with a muted layer of what smells like the noble hops (exactly which one(s), I couldn't say) the style should have. To make an easy comparison, the hop aroma's similar to Sam Adams' Noble Pils - just not as bright. Some of the malt notes remind me of their Route des épices - the rye, and even a bit of the spice. On the tongue, the hops come forward a bit more. They still play second fiddle to the beer's richer traits, but their bitterness and tingle in the aftertaste do come through. The richness of this beer comes through as hearty rye bread & sweet notes of molasses cookies. The mouthfeel is medium and smooth, with a bit of a dry finish overall. The carbonation is there just enough to help keep things feeling light. I brewed an altbier recipe I found last winter (using Hallertau as the hop charge) and fell in love the with style. Such a great, balanced style.